Maintaining our customers’ satisfaction, health and safety is our key focus. Our group uses the most up to date and state of the art production technology and practices in our production cycles to ensure the highest levels of food hygiene, safety and quality are supplied to our domestic and overseas clients worldwide. Thai Jasmine Rice or “Hom Mali” is originated in Thailand. Regarded as the highest quality of Thai Rice, “Hom Mali” is recognized as the favored rice for use to accompany gourmets dishes both domestically and worldwide because cooked “Hom Mali” is shiny, soft and tender with a natural aromatic ﬂavor. The famous land of the best quality “Hom Mali” cultivation is situated in Northeastern part of Thailand (Isan) where Eastern Rice Mill Co, Ltd is located. TANASAN RICE GROUP has initiated the scheme to collaborate with local farmers special in this area in order to achieve sustainable production of the highest quality and purity of the “Hom Mali” breed. Moreover, we are continuing to expand our market niche and seek more demand from customers who are in pursuit of the most premium of quality for “ Hom Mali ” Rice directly from the original source of cultivation. “Pathumthani Rice” is the new strain of Thai Fragrant rice, which was developed in Pathumthani Rice Institute in Thailand over many decades previously. Compared to “Thai Hom Mali” Rice, it has similar characteristics in terms of natural fragrance and soft texture. Sanroumphol999 & Tanasan Rice ( 2 mills in our group) are located in “Chai Nat Province” which is one of the most important areas where “Pathumthani Rice” is cultivated and is the situated in the center of Thailand. Therefore the most abundant quantity and quality can be collected, milled and controlled by our group directly. “Thai White Rice” is the regular-milled or polished rice derived from the white paddy. Fluffy when cooked, this type of rice is recommended for those who prefer hard-cooking rice. Located in many areas of quality rice cultivation, especially, Chai Nat, one of the most important and famous land of “Thai White Rice”, Tanasan Rice Group has sufﬁcient capacity to produce various grades of Thai White Rice throughout the year. Parboiled Rice is processed by special techniques of soaking paddy in hot water under pressure, steamed and dried before milling. These processes retain most of the essential nutrients better than regular-milled white rice. To produce this type of rice at best quality, we operate effectively step by step our special technique by modern technology in Thanakorn Banjong San.Co.,Ltd, Tanasan Rice.Co.,Ltd, and Eastern Rice Mill.Co.,Ltd. 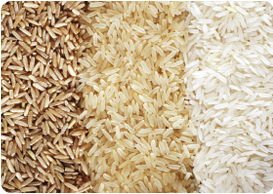 We can ensure good uniformity of color and appearance due to all Processes being identical in each of our mills, thus when you purchase Parboil Rice from us you can be certain that all the rice are from the same milling group hence you are certain to get good uniform color and quality. Due to its chalky white color, Glutinous Rice can be easily distinguished from other type of rice. It's also called Sticky Rice because it becomes sticky when cooked. The glutinous broken rice is also demanded from customers especially from the Chinese market, because the rice is required in many ingredients such as Chinese traditional desserts. “Glutinous Rice” can be used not only in recipes, but also usually forming parts of many ingredients in commercial product. In Thailand, the most important areas of growing Glutinous Rice are Northern and Northeastern provinces, our group is fortunate to have two big mills situated in the right location (Thanakorn Banjong San.Co.,Ltd and Eastern Rice Mill.Co.,Ltd), which allow us to produce and deliver continuously throughout the year. Brown Rice also known as Cargo / Loonzain Rice, this rice is highly nutritious as bran layer is still intact. It contains high fiber, vitamin B, carbohydrate, and protein. With adequate capacity of production and technology applied. Tanasan Rice Group has ability to provide tailor made rice product according to requirement provided by customer. Customer can be assured that delivered product meet the requirement for both quality and quantity demand.